In a recent post, I extolled the virtues of a wonderful OSS library I had found for working with Excel data programmatically, LinqToExcel. In that post, I also mentioned a fantastic library for working with Word docs as well, and promised to discuss it in my next post. This is that post. The big pain point in working with MS Word documents programmatically is . . . the Office Interop. To get almost anything done with Word (including simply pulling the text out of the document, you pretty much need to use Interop, which also means you have to have Word installed on the local machine which is consuming your application. Additionally, my understanding is that there are issues with doing Word automation on the server side. Interop is essentially a giant wrapper around the ugliness that is COM, and the abstraction layer is thin indeed. If you need to automate MS Office applications, Interop (or going all the way down to the COM level) is pretty much the only way to do it, and obviously, you need to have Office installed on the client machine for it to work at all. Often times though, we don’t so much need to automate the office application directly so much as get at the contents of Office file (such as Word or Excel files). Dealing with all that Interop nastiness makes this more painful than it needs to be. Thankfully, the open source DocX library by Cathal Coffey solves both problems nicely, and unlike Interop, presents an easy-to-use, highly discoverable API for performing myriad manipulations/extractions against the Word document format (the .docx format, introduced as of Word 2007). Best of all, DocX does not require that Word or any other Office dependencies be installed on the client machine! 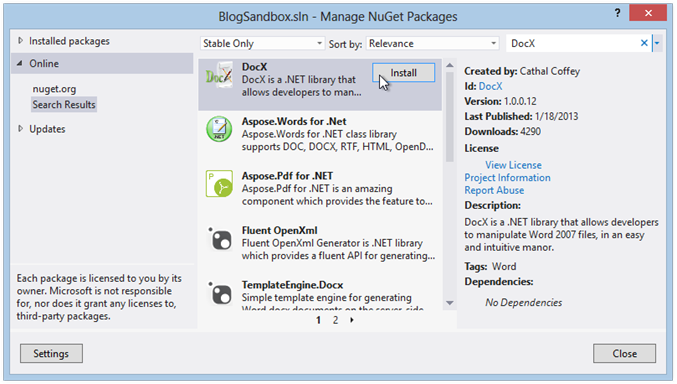 The full source is available from Coffey’s Codeplex repo, or you can add DocX to your project using Nuget. 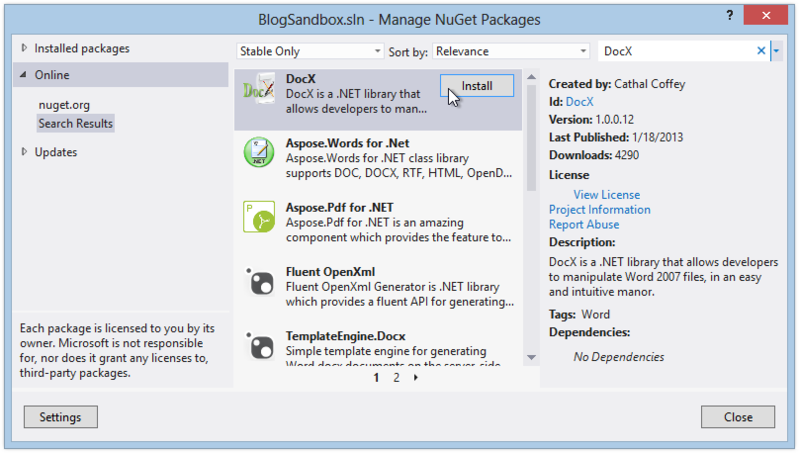 In this post, we will look at a few of the basics for using this exceptionally useful library. Know that under the covers and with a little thought, there is a lot of functionality here beyond what we will look at in this article. Find and Replace Text Using DocX -Merge Templating, Anyone? Create an in-memory instance of a DocX object with a file name passed in as part of the constructor. Insert a DocX.Paragraph object containing some text. Save the result to disc as a properly formatted .docx file. Until we execute the Save() method, we are working with the XML representation of our new document in memory. Once we save the file to disc, we find a standard Word-compatible file in our Documents directory. + "We the People of the United States, in Order to form a more perfect Union, "
+ "establish Justice, insure domestic Tranquility, provide for the common defence, "
+ "promote the general Welfare, and secure the Blessings of Liberty to ourselves "
In the above, the FontFamily and Size properties of the Formatting object are self-evident. The Position property determines the spacing between the current paragraph and the next. Yes, yes I DID print that headline in Comic Sans. Just, you know, so you could see the difference in formatting. 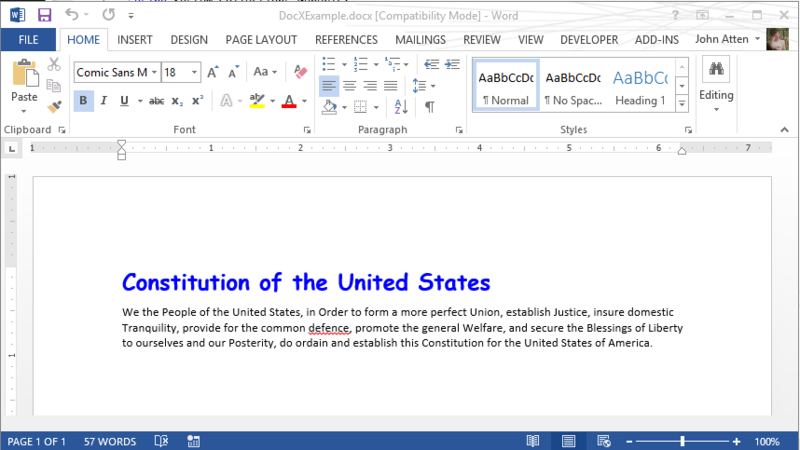 There is a lot that can be done with text formatting in a DocX document. Headers/Footers, paragraphs, and individual words and characters. Importantly, most of the things you might go looking for are easily discoverable – in other words, the author has done a great job building out his API. Find and Replace Text Using DocX – Merge Templating, Anyone? 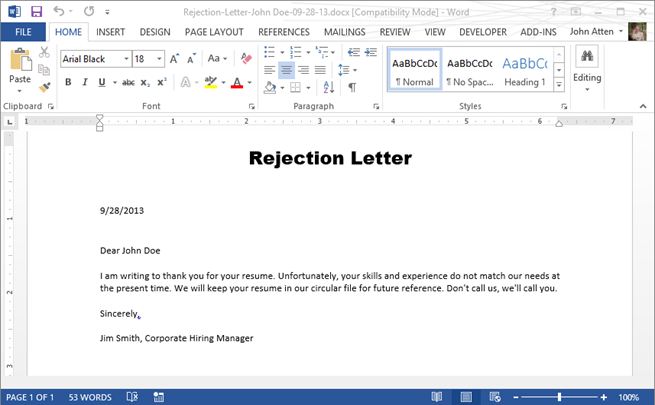 + "I am writing to thank you for your resume. Unfortunately, your skills and "
+ "experience do not match our needs at the present time. We will keep your "
+ "resume in our circular file for future reference. Don't call us, we'll call you. " Obviously, the preceding example was a little contrived and overly simple. But you can see the potential . . . If our letter contained additional “merge fields, we could just as easily pass in a Dictionary<string, string>, where the Dictionary contains one or more Key Value Pairs containing a replacement target and a replacement value. Then we could iterate, using the Dictionary Keys as the search string, and replace with the Dictionary values. In this quick article, we have only scratched the surface. DocX exposes most of the stuff we commonly wish we could get to within a Word document (Tables, Pictures, Headers, Footers, Shapes, etc.) without forcing us to navigate the crusty Interop model. This also saves us from some of the COM de-referencing issues which often arise when automating Word within an application. Ever had a bunch of “orphaned” instances of Word (or Excel, etc.) running in the background, visible only in the Windows Task Manager? Yeah, I thought so . . . If you need to generate or work with Word documents on a server, this is a great tool as well. No dependencies on MS Office, no need to have Word running. 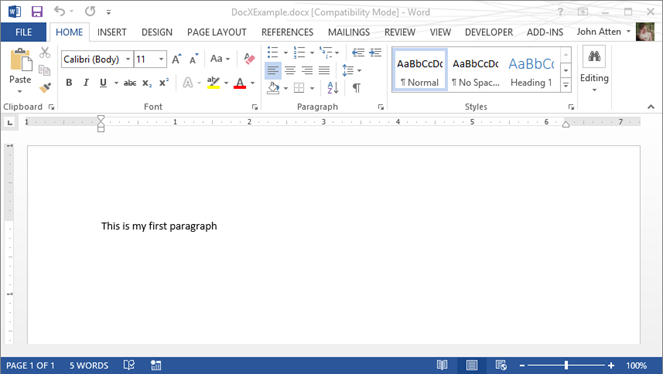 You can generate Word documents on the fly, and/or from templates, ready to be downloaded. I strongly recommend you check out the project on Codeplex. Also, the project author, Cathal Coffey, discusses much of the DocX functionality on his own blog. If you dig DocX, drop by and let him know. He’s really done a fantastic job. darkFreq – Thanks for reading, and hope it works out for you! Please let me know how it goes, and if you run into anything cool, post back here in the comments . . .
Sakapuce – Yeah, right? 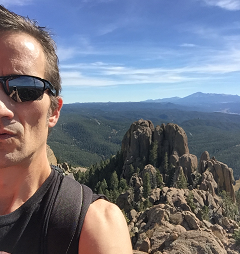 Thanks for reading, and taking the time to comment! A serious alternative to Aspose. Thanks so much for writing this. This will save us a ton of time. We were able to work our way around the text and formatting but the image manipulation confounded us. Can't wait to try this out; from the code samples is looks so simple. A million thanks!!! Yes, I had also found another templating library I've yet to have the time to check out. Now I'm adding your suggestion to my list as well. 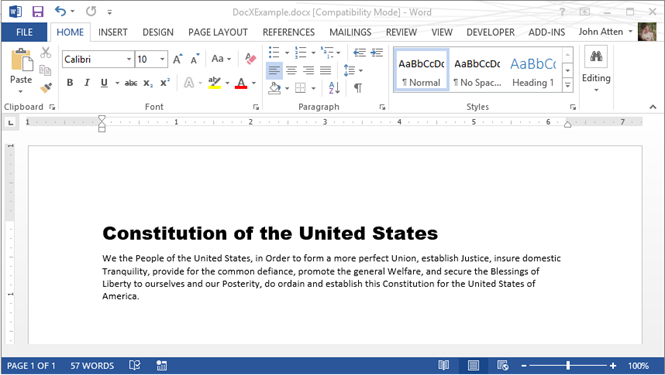 DocX library is indeed very powerful and flexible. As an extremely simple alternative, where only Search-Replace(Templating) is required, here's another one that does the trick without using any third party libraries.